Opening Dedication. Structural Biology of the Tumor Suppressor p53 and Cancer-Associated Mutants. Immunotherapy by Allogeneic Stem Cell Transplantation. Mnt Takes Control as a Key Regulator of the Myc/Max/Mxd Network. Lytic Cycle Switches of Oncogenic Human Gammaherpesviruses. No Life Without Death. Control of Apoptosis in Human Multiple Myeloma by Insulin Like Growth Factor I (IGF-I). C-MYC Impairs Immunogenicity of Human B Cells. Cancer Dormancy: Lessons From a B Cell Lymphoma and Adenocarcinoma of the Prostate. Therapeutic Targets of Multiple Angiogenic Factors for the Treatment of Cancer and Metastasis. The Advances in Cancer Research series provides invaluable information on the exciting and fast-moving field of cancer research. A very special event the Nobel Minisymposium, “Molecular Oncology – From Bench to Bedside,” held at the Karolinska Instituet, in Stockholm, Sweden, was marked the celebration of George and Eva Klein’s combined 160th birthday. 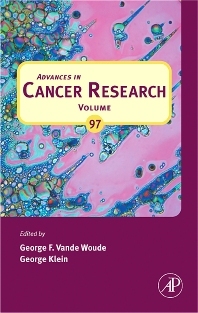 To honor this occasion, this volume brings together contributions by their former students, colleagues and collaborators of the past fifty years into a volume of Advances in Cancer Research dedicated to George and Eva. Over a decade ago, a subdivision of ACR called “Foundations in Cancer Research” was initiated and the tributes honoring the Kleins’ bodies of work presented at the minisymposium are especially appropriate for the series.